Today KEW participants enjoyed a musical museums morning! We talked about our St Cecilia’s Hall Project – the University of Edinburgh’s £6.5m project to restore, renovate and make accessible Scotland’s oldest concert hall and its world class collection of historic musical instruments. The Project will transform St Cecilia’s Hall into the UK destination for the study, display, performance and enjoyment of historic musical instruments; deliver an engagement plan based on inclusion and widening community engagement; diversify the audience through working with local organisations and schools; deliver opportunities for student involvement including curatorial activity and research; and attract more students to study our world-class collection. The building dates to 1763 and was designed by architect Robert Mylne. When it was first opened the building made quite an impact on Edinburgh society, with one observer commenting, “I have seen no concert room equal to it either in London or Paris”. Today the building is owned by the University of Edinburgh, and houses its world-class collection of historical musical instruments. However later additions to St Cecilia’s have left the original Georgian concert hall hidden from view at the heart of the building. We are restoring and renovating the building and its facilities in order to preserve its collection and broaden its appeal to a wider public. We are redesigning the galleries, and using ibeacons, an app and mobile web technology to provide layers of contextual and technical information about the building and the collection – and enable visitor to see and hear how the instruments are played. After the talk by Jacky MacBeath, we saw some of the musical instruments with Darryl Martin, Principal Curator of the Musical Instrument Collection. This included the 17th century Bassano violin we had heard being played in a recording earlier in the morning. 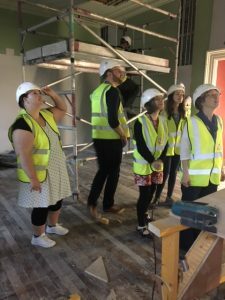 Later KEW participants enjoyed a tour of the building site, and saw St Cecilia’s Hall at a moment in this new period of its development. We viewed the elliptical concert hall with its ceiling light, the new gallery spaces that will display over 500 musical instruments, and the impressive sculptural four-floor steelwork that is the supporting structure for the new entrance, mezzanine, plant and staff areas. We also learned about some of the goings-on in and around Niddry Street where St Cecilia’s is located including complaints in the 18th century to the council about street lighting and litter collection – nothing changes! All KEW participants are very welcome back when St Cecilia’s Hall opens to the public in mid-February 2017.